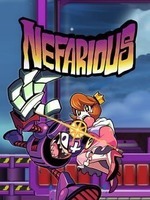 Nefarious is a 2d-animated action platformer, where your objective on each stage is to kidnap a princess and then escape with them! Heroes will attempt to thwart you, and many things may not go quite as expected. Nefarious's Hash Tag Analysis Game Sense posts are organized via HashTags. You, or the original poster, can add HashTags to any post based on what you think the post best represents. Then, posts are organized and scores are broken down by HashTag.